Kettle corn, all honey-roasted peanuts, the bacon milkshake—is there any better flavor combination than salty and sweet? This month's recipe pairs a salty pretzel crust with rich dreamy cream cheese, topped with the tart zing of strawberries to round out this perfect symphony of flavors. Light and fruity desserts are a great pick for sweltering summer days, and nothing beats the refreshing taste of fresh-picked strawberries. 2 cups light rolled pretzels 1 cup melted butter (2 cubes) 3 tbsp sugar Combine and bake in an oven at 400 degrees for 10 minutes. 8 oz cream cheese 2/3 cup sugar 2 cups Cool Whip Cream together cream cheese and sugar with mixer. Mix together Jell-O and water and, when dissolved, add strawberries. 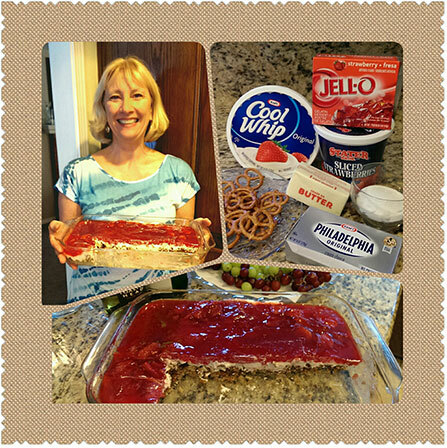 When Jell-O begins to gel, gently pour on top of Cool Whip layer and refrigerate overnight.